Yesterday I shared with you a small white cardigan I made for the grandson of my friend. Today I am back with an aqua green jumper I made at the same time. 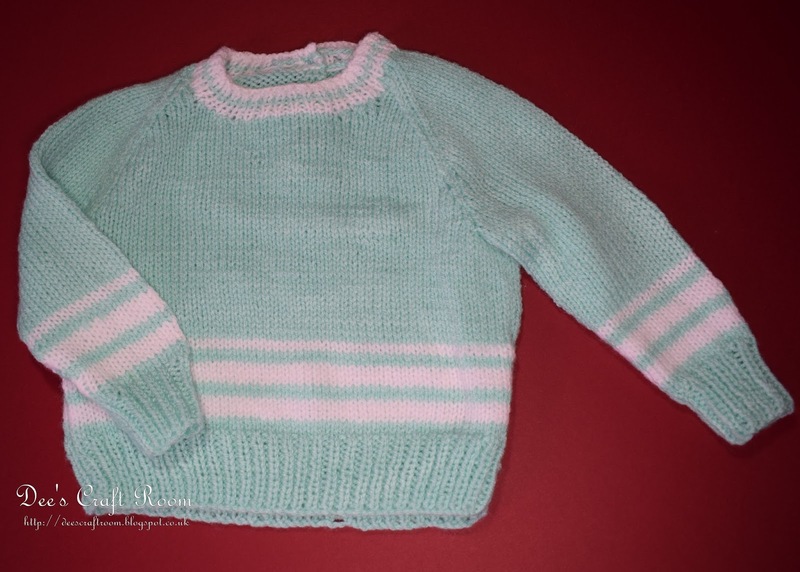 I wanted to jazz up this plain Double Knit jumper a little, so I added a few white stripes. Thank you Pamellia, with all the snow you have at the moment I should imagine you need lots of layers to keep warm. A lovely cardigan would be 'just what the doctor ordered'. Hi Carol, I hope you are managing to keep warm. Up and down the country all my friends are commenting on how much colder it has turned. Thank you for your lovely comment, I photograph clothes very poorly and this is definately one of those things which look a lot nicer in real life. Thank you so much. I hope you are OK and had a great Christmas?